Why Your Baby Needs a Kolcraft Tiny Steps Walker? If your precious child is starting to take their first steps or has just mastered walking, then you know exactly how proud and accomplished you feel as a parent. You have watched over their every attempt to stand on their fragile little feet precariously, and then one day they finally, they learn to master their strides successfully. The feeling when your child tries to walk towards you, all shaky and flimsy, from the bedroom door to the kitchen, to eventually dive into your arms is probably one of the world’s most incredible feelings.These small steps matter. Kolcraft Tiny Steps Walker helps to take the baby one step farther which not only broadens the smile of the baby but gives you a satisfied sigh of relief for your wise investment. For your precious baby to learn to walk, and walk properly, you as a parent must make sure that that they get the proper guidance and support with each of their baby steps. Getting them a good walker is essential for their learning, curious feet. Now, a walker is not often given too much importance when shopping for a baby’s gears. Most parents will often see Walker as a merely wheeled framework in which to put their babies for them to move around with it. Little you realize this Walker will happen to decide your baby’s first learning experience in life. It is very important, prior to purchasing just any old basic baby walker, and that some factors and aspects are taken into consideration. 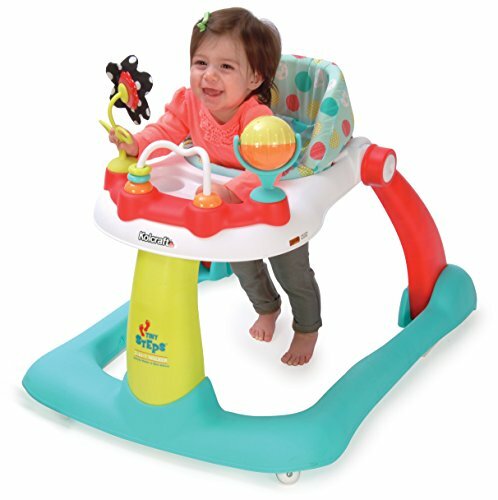 My choice for the favorite baby walker is undoubtedly the Kolcraft Tiny Steps 2-in-1 Activity Walker. I have chosen this Walker over many others because of its various smart and convenient aspects. 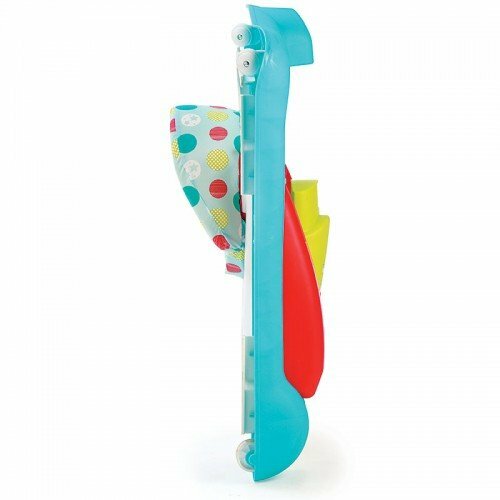 The Kolcraft Tiny Steps 2-in-1 activity walker is exactly what is says it is. It Is a dual purpose walker. 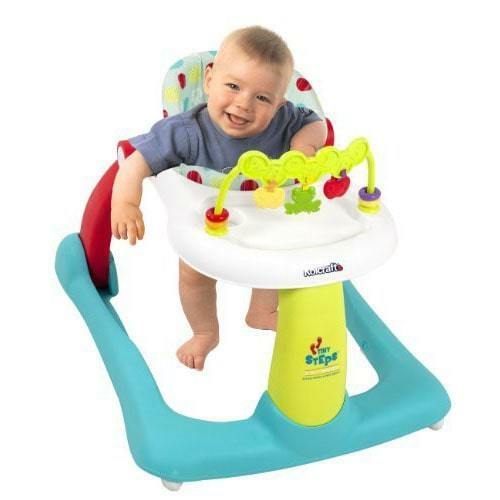 It serves as a sitting Walker for infants who are just starting to take their learning steps. While, simultaneously, serving as a standing Walker to cater to the needs to toddlers who have already learned how to walk, but would still need additional support. This Walker weighs in at 7.5 lb. Needless to say, it is a lightweight walker, making it easy to carry around. But, do not mistake its low weight for anything. This walker can easily accommodate weights from 16 lb to a maximum of 26 lb. 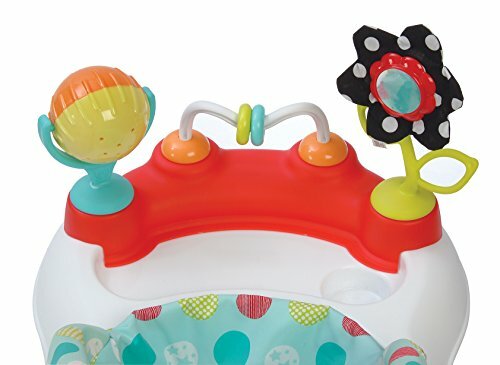 It comes with a toy tray with a generous array of toys to play with. The wheels can both be used for free motion or made stationary by locking the front wheels set. It can be folded flat, and its seat pad can be machine washed. It's assembled dimension is 30” in length, 24.3 inches in width and 8” in height. Its dual function features most inspired my Kolcraft Tiny Steps review. This walker caters to both infants who are just learning to walk, and toddlers who need the walker to polish off their walking skills. Infants can use it sitting in the seat while, toddlers use it by walking behind the walker, standing. This not only saves money from the cost of purchasing another Walker but also ends up saving space. Now, let’s be honest, the last thing parents need is an empty wallet with a room full of walkers. For the years to come, every penny saved will be a reward in itself, and you know it too. 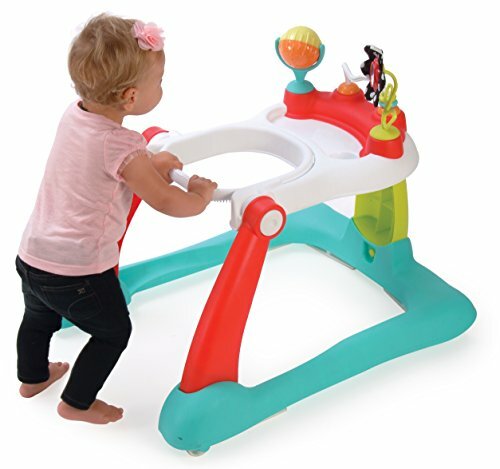 This Kolcraft activity walker comes with a generous array of activity toys on its tray to polish your baby’s motor skills. The toys require no batteries, here’s one less thing to worry about. In other words, this means your baby is bound to remain engaged and entertained with the activity toys while you sneak in a small nap without having to watch over them like a hawk. My Kolcraft Tiny Steps review acknowledged how hard it is to find time for yourself when picking this walker. Get yourself a cup of tea, or read a book while your baby plays, I mean polishes his motor skills. You deserve it! My Kolcraft Tiny Steps review would never have picked this walker unless it ensured child safety. This Walker comes with non-skid friction pads on the base on the frame to maintain balance and stability while moving. This walker can be used as a stationary walker by locking the front wheels. A high back plush seat provides ultimate comfort and support for your baby. The seat pad is machine washable. The height of the seat can be adjusted to your baby’s growth. What makes this Kolcraft activity walker so amazing is that it can be folded flat. This not only makes it easy to store but also ideal for travel. The most comforting aspect of this walker would be that it comes with a one-year warranty. The ability to fold flat makes it ideal for carrying around and travel with ease. It serves a dual purpose: as a sitting walker and a standing Walker. It is incredibly affordable considering its dual purpose features. Its front wheels can be locked to keep the walker in a fixed position. The toys on its tray could wear out since they do not require the use of batteries. Question: Does the Walker work on carpets? Answer: Yes, it does work on carpets. Question: Do the wheels of the walker scratch hardwood floors? Answer: No, the wheels leave no mark or scratches on hardwood floors. The baby toy has won my vote with its dual purpose feature. It saves the cost and space of buying another walker, clearly making it a more versatile option. The toys on the walker are great entertainers for the kids. Several adjustments can be made to the walker, like adjusting seat height and wheels fixation. It folds flat allowing for easy storage and also making it very travel-friendly. These Kolcraft walkers have just many features worth checking it out, and makes for a product that is hard to say no to!